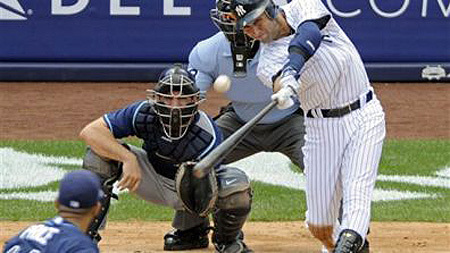 Derek Jeter joined the elite 3000 hit club going 5 for 5 against the Tampa Bay Rays. It was a remarkable performance. Jeter has struggled at the plate this year and spent a number of weeks on the disabled list. It was the last chance before the All Star break and the beginning of a long road trip for the Yankees that he had to get 3000 hits. Had he not done so today it a place where he is loved and a part of an enduring legacy of great Yankees, none who ever had 3000 hits he would have done so on the road. It would have been like Hank Aaron breaking Babe Ruth’s record in San Diego, Cal Ripkin Jr. breaking Lou Gehrig’s consecutive game record in Oakland, or Pete Rose breaking Ty Cobb’s hit record in Montreal, which according to some he did in Chicago the game before he broke the record in Cincinnati, not that there’s anything wrong with that. But such records are meant to occur at home. Somehow they just seem more magical when done at home. Today Jeter not only reached 3000 hits mark he did it with aplomb going 5 for 5 with a Home Run and a double and two RBIs. His 3000th hit was a Home Run on a 3-2 count to deep left field with one out in the bottom of the 3rd inning against Ray’s ace David Price. Price in his career has held Jeter to 6 hits in 25 at bats with only 2 extra base hits and 3 RBIs, not a bad record against Jeter who has a career .312 batting average. Only one other play hit a home run for his 3000th hit, Wade Boggs who did it in 1999. There are only 28 players in this club and they include 24 Hall of Famers. The only ones of the club not yet in the Hall of Fame include Jeter who is still active, Craig Biggio who will soon be eligible to be voted in to the Hall of Fame, Rafael Palmeiro who is tainted by the steroids controversy and the all time hit leader Pete Rose who is banned from baseball for life for betting on games. The 3000 club is truly remarkable. It includes Rose with 4256 hits, Ty Cobb-4191, Hank Aaron-3771, and Stan Musial with 3630 hits. Also on the list are greats like Cal Ripkin Jr., Willie Mays and Roberto Clemente. The rest of the men on this list are also remarkable. All had amazing careers that spanned many years frequently with the same team. Their longevity, consistency and ability to get hits were simply remarkable but even more remarkable for Jeter was that he was the first Yankee to reach the 3000 hit mark. The next nearest is the legendary Lou Gehrig with 2721 and Babe Ruth with 2518. It is conceivable that had Ruth not pitched his first four years in the Majors or had Lou Gehrig not been forced to retire due to ALS or as some now posit numerous significant concussive injuries that either of them might have been the first Yankee to reach this lofty plateau. However that feat belongs to Derek Jeter, the Captain of the Yankees and a man who will by his on-field performance, consistency, work ethic and leadership on and off the field will be in that elite group of Yankee legends. He will also be remembered as a baseball great something that even Yankee haters have to admit. Someday, hopefully after he has added much more to his legacy and retires he will be become part of the panoply of immortals in the Hall of Fame and have his monument added to those that grace Monument Park at Yankee Stadium along with Babe Ruth, Lou Gehrig, Mickey Mantle, Yogi Berra, Joe DiMaggio, Miller Huggins, Casey Stengel, Reggie Jackson, Lefty Gomez and so many more. It was a good day for Derek Jeter and his family, the Yankees, baseball and all that love this most magical game.